IL-7 is critical for B cell production in adult mice; however, its role in human B lymphopoiesis is controversial. One challenge was the inability to differentiate human cord blood (CB) or adult bone marrow (BM) hematopoietic stem cells (HSCs) without murine stroma. Here, we examine the role of IL-7 in human B cell development using a novel, human-only model based on coculturing human HSCs on primary human BM stroma. In this model, IL-7 increases human B cell production by >60-fold from both CB and adult BM HSCs. IL-7-induced increases are dose-dependent and specific to CD19+ cells. STAT5 phosphorylation and expression of the Ki-67 proliferation Ag indicate that IL-7 acts directly on CD19+ cells to increase proliferation at the CD34+ and CD34− pro-B cell stages. Without IL-7, HSCs in CB, but not BM, give rise to a small but consistent population of CD19lo B lineage cells that express EBF (early B cell factor) and PAX-5 and respond to subsequent IL-7 stimulation. Flt3 ligand, but not thymic stromal-derived lymhopoietin (TSLP), was required for the IL-7-independent production of human B lineage cells. As compared with CB, adult BM shows a reduction of in vitro generative capacity that is progressively more profound in developmentally sequential populations, resulting in an ∼50-fold reduction in IL-7-dependent B lineage generative capacity. These data provide evidence that IL-7 is essential for human B cell production from adult BM and that IL-7-induced expansion of the pro-B compartment is increasingly critical for human B cell production during the progression of ontogeny. Murine studies have provided evidence that B cell development is controlled by a network of transcription factors and cytokine signaling that coordinates stage-specific expression of B lineage genes (1, 2). In mice, signaling through two cytokine receptors, Flt3 and IL-7R, are critical for B cell development. The combined loss of signaling through both of these receptors completely blocks fetal and adult B cell development (3, 4). Flt3 signaling up-regulates IL-7Rα expression (5). In adult mice, signaling through the IL-7R up-regulates expression of early B cell factor (EBF).3 EBF in turn regulates expression of a cascade of B cell-specific genes (1, 2) required for the transition from the common lymphoid progenitor to pro-B cells (6, 7, 8). During fetal and neonatal life, IL-7-independent expression of EBF allows early B lineage differentiation, but not proliferation, unless IL-7 is present (9). Human B cell development is thought to differ from that in mouse with respect to the requirement for IL-7. Early evidence for the importance of IL-7 in murine B cell production came from in vitro studies showing that B cell precursors derived from adult bone marrow (BM) increase by ∼50-fold with the addition of IL-7 (10). Further evidence came from reports of blocked B cell development in the initial in vivo studies that characterized mutant mice with defects in IL-7 (11), or in components of the IL-7R (12, 13). Parallel in vitro studies of human B cell development were performed either using fetal hematopoietic sources (14, 15, 16, 17, 18, 19, 20) or using hybrid cocultures with human progenitors and murine stromal cell lines (21, 22, 23). In those experiments IL-7 either had no effect on B cell production or resulted in IL-7-induced increases that were 10-fold less than those reported in the mouse. In vivo human data from clinical reports indicated that patients having severe combined immunodeficiency due to defects in IL-7/IL-7R signaling lack T cells, but have peripheral blood B cells (24, 25, 26). These data have been interpreted to mean that IL-7 is essential for normal murine, but not human, B cell development (27, 28, 29, 30, 31). More detailed studies in the mouse revealed a dramatic change in B cell precursor requirements during ontogeny. IL-7 knockout mice show a block in adult B lymphopoiesis, but not in the production of B cells, during the fetal or neonatal period (32). More recently it has been shown that IL-7-independent expression of EBF in the mouse allows B lineage differentiation early in ontogeny resulting in a “developmental switch” in murine stem cells, with IL-7-independent B cell production occurring during fetal development and through the first 2 wk of neonatal life, but not in the adult (9). Thus, it is not surprising that in vitro IL-7 effects on fetally derived human B cell precursors (14, 15, 16, 20, 33, 34) were minor when compared with those observed for adult B lymphopoiesis in the mouse (10). Similarly, clinical data from patients with IL-7/IL-7R signaling defects were obtained early in life and are consistent with observations that fetal/neonatal B cell production is intact in mice with IL-7 defects. It is also possible that residual, low-level IL-7R signaling plays a role in B cell production in patients with defects in the IL-7R or its signaling pathway. Phosphorylation of STAT5 is a signaling event downstream of IL-7R ligation (35). Studies that compare B cell development in mice that are STAT5 null with that in STAT-deficient mice that express a truncated form of STAT5 reveal that even low levels of residual IL-7R signaling can maintain B cell production in adult mice (36, 37). Experiments to assess for IL-7 function in human patients with defects in components of the IL-7R signaling pathway are limited by the number, type, and quantity of specimens available for study. Thus, in vitro studies of human B cell development are essential for determining the role of IL-7 in human B cell development and whether humans exhibit the developmental switch that results in the loss of IL-7-independent B cell production observed in the mouse. The association between ontogeny and IL-7 requirements has not been rigorously examined in humans. In vitro studies that address the role of IL-7 in human B cell production during the neonatal period and through adulthood have been performed using hybrid human-mouse coculture models (21, 22, 23). The limitations of this model were highlighted by recent reports demonstrating that murine IL-7 can stimulate signaling through the human IL-7Rα (22, 23, 38). Thus, the production of murine IL-7 by stroma in hybrid human-mouse cocultures has rendered it difficult to evaluate the precise contribution of human IL-7 and the magnitude of IL-7-dependent effects in human B cell production from hematopoietic stem cells (HSCs) in cord blood (CB) and BM. Here we describe a novel, entirely human model of in vitro B cell development that is based on coculturing human HSCs on primary human BM stroma. Using this human-only model we show that human IL-7 increases the production of human B cell precursors by >60-fold, both from HSCs in adult BM and from the HSCs in CB that give rise to B cells during the neonatal period. IL-7 effects were mediated through the direct action of human IL-7 on human CD19+ pro-B cells to increase proliferation at both the CD34+ and CD34− stages of B cell development. Adult BM, as compared with CB, shows a reduction of in vitro generative capacity that is progressively more profound in developmentally sequential populations, resulting in an ∼50-fold reduction in B lineage generative capacity. In the absence of IL-7, HSCs in CB, but not in BM, give rise to a small but consistent population of CD19lo B lineage cells that express EBF, PAX-5, and respond to IL-7 with increased cell size and up-regulation of CD19. These data suggest that in humans the role of IL-7 in B cell production becomes increasingly critical as ontogeny progresses, and that it is an essential factor for B cell production in adults. CB was collected according to guidelines approved by the Institutional Review Boards at Childrens Hospital Los Angeles and Loma Linda University. Adult human BM was purchased from AllCells, the National Disease Research Interchange, or Poietics cell systems of Lonza. The leukapheresis product from a patient with pre-B ALL (>90% CD19+ cells) served as a source of primary human pre-B ALL cells. The use of all human tissues was reviewed and approved by the Institutional Review Boards at Childrens Hospital Los Angeles and/or Loma Linda University. Primary murine BM was obtained from normal adult control mice immediately after they were sacrificed as a part of other studies approved by the Institutional Animal Care and Use Committees at Childrens Hospital Los Angeles or Loma Linda University. Lineage marker negative (Lin−) CD34+ cells were isolated by FACS sorting from CD34-enriched CB and BM mononuclear cells as previously described (39). Primary stromal cells from adult human or murine BM were obtained by plating whole BM in Dexter’s original medium as described previously (40). Nonadherent cells were removed on the second day and adherent cells were used through passage six. The murine S17 (41) stromal cell line was a generous gift from Dr. Kenneth Dorshkind (University of California at Los Angeles), and the murine MS-5 (42) stromal cell line was a generous gift from Dr. Kazuhiro Mori (Niigata University, Niigata, Japan). Human CB and adult BM HSCs (typically ∼10,000 and ∼15,000, respectively) were seeded onto murine stromal cells preplated at 3500 cells/well (hybrid cultures) or onto sublethally irradiated (2000 rad) primary human BM stromal cells plated at 7000 cells/well (human-only cultures) in 96-well tissue culture plates in B cell medium (RPMI 1640 medium (Irvine Scientific) containing penicillin/streptomycin, l-glutamine, 50 μM 2-ME, and 5% FBS (Omega Scientific) lot tested for ability to support B cell production). Sublethal irradiation assured that culture progeny did not arise from residual human HSCs that might be associated with the BM-derived stroma. Control cultures were supplemented with IL-3 at 1 ng/ml (first week only) and Flt3 ligand at 1 ng/ml or 50 ng/ml (R&D Systems), two cytokines that have previously been shown to support the production of human B lineage cells in vitro (19, 43, 44, 45). Additional supplementation with recombinant human cytokines and/or Abs is described in the figure legends or as follows: IL-7 at 5 ng/ml, stem cell factor at 25 ng/ml (R&D Systems); neutralizing anti-human IL-7 Ab or control Ab at 10 ng/ml (BD Pharmingen); neutralizing anti-mouse IL-7 Ab (Abcam) or control Ab (Jackson ImmunoResearch Laboratories); neutralizing anti-human thymic stromal-derived lymphopoietin (TSLP) Ab (R&D Systems) or control Ab (Jackson ImmunoResearch Laboratories) at 1 μg/ml; neutralizing anti-human Flt-3 ligand or control Ab (R&D Systems) at 0.6 μg/ml. The 50% neutralizing dose (ND50) for rabbit anti-mouse IL-7 neutralizing Ab was 0.012–0.02 μg/ml of Ab for mouse IL-7 at 600 pg/ml. The ND50 for rat anti-human IL-7 neutralizing Ab was 0.0001–0.001 μg/ml of Ab for human IL-7 at 167 pg/ml. The ND50 for sheep anti-human TSLP was 0.05–0.25 μg/ml for 0.5 ng/ml human TSLP. The ND50 for mouse anti-human Flt-3 ligand was 0.02–0.06 μg/ml for 5 ng/ml Flt-3 ligand. For cultures described in Fig. 4A, each well contained three Abs: either the neutralizing Ab to Flt-3 ligand, IL-7, and/or TSLP, or the corresponding control Ab at an identical concentration as neutralizing Ab. Wells to which exogenous cytokine were added received the appropriated control Ab for that cytokine. This assured that Ab isotypes and concentrations were the same in all wells. To simplify, only neutralizing Abs (and not control Abs) are indicated in the legend to Fig. 4A. CD19+ progeny from human-only cultures were enriched for apoptosis assays using the human B cell enrichment kit (StemCell Technologies) and for assays of STAT5 phosphorylation using the Miltenyi Biotec CD19 MicroBead kit. For flow cytometry cells were surface stained as described previously (46) and resuspended in PBS for FACS sorting using the FACSVantage or FACSAria cell sorter (BD Immunocytometry Systems) or in PBS or 1% freshly prepared formaldehyde for analysis using the FACSCalibur flow cytometer. The following Abs were used: κ-FITC, λ-FITC, IgM FITC, IgM PE-Cy5 (CyChrome), CD19 allophycocyanin, CD34 PerCP (BD Pharmingen), and IL-7Rα PE (Beckman Coulter-Immunotech). To assess cytoplasmic μ (cμ) and Ki-67 expression, cells were first stained for surface markers and then stained with anti-IgM Abs to detect intracellular cμ, with anti-Ki-67, or with an isotype-matched control Ab (BD Pharmingen) using the Fix and Perm cell permeabilization kit (Caltag Laboratories) as per the manufacturer’s instructions. For phospho-STAT5 staining, cells were washed, fixed by incubating for 10 min with 1.5% paraformaldehyde at room temperature, pelleted by centrifugation, and then paraformaldehyde was decanted off. To permeabilize, cells were vortexed, resuspended in 100% methanol at 4°C, and incubated for 10 min at 4°C or at −20°C overnight. Cells were pelleted by centrifugation, washed in PBS with 10% FBS and 0.01% sodium azide, and then incubated with anti-phospho-STAT5 PE or mouse IgG1 PE isotype control Ab (BD Pharmingen) for 30 min at room temperature. Cells were then washed and resuspended in staining buffer for flow cytometry. To assess apoptosis, harvested cells were incubated with CD19 allophycocyanin and the apoptosis indicator annexin V FITC (BD Pharmingen) and prepared for flow cytometry according to the manufacturer’s instructions. Fluorescence intensity on all flow cytometry dot plots and histograms is shown on a log scale. Forward scatter (FSC) and percentage maximum on histograms are shown in a linear scale. Primary murine and human BM stromal cells (nonirradiated, 3500 cells or sublethally irradiated (2000 rad, 7000 cells) and murine MS-5 and S17 stromal cells (nonirradiated, 3500 cells) were plated in 200 μl of B cell medium (described above) without cytokines in individual wells of a 96-well plate. At weekly intervals 100 μl of culture medium was harvested, filtered with a 0.2-μm filter, and 100 μl of new media was added to each well. Harvested supernatants were frozen, thawed, and IL-7 levels were detected using the mouse IL-7 or human IL-7 ELISA kit (R&D Systems). cDNA was prepared as described previously. RT-PCR to detect expression of IL-7 and β2-microglobulin was performed as described previously (39). Intron-spanning PCR primers for mouse and human IL-7 and β2-microglobulin were as follows: human β2-microglobulin, 5′-CTC GCG CTA CTC TCT CTT TC-3′ and 5′-CAT GTC TCG ATC CCA CTT AAC-3′ (330-bp product); human IL-7, 5′-CTC CCC TGA TCC TTG TTC TG-3′ and 5′-TCA TTA TTC AGG CAA TTG CTA CC-3′ (151-bp product); mouse β2-microglobulin, 5′-TGC TAT CCA GAA AAC CCC TC-3′ and 5′-GGC ATG CTT AAC TCT GCA GG-3′ (259-bp product); and mouse IL-7, 5′-TGG AAT TCC TCC ACT GAT CC-3′ and 5′-TGG TTC ATT ATT CGG GCA AT-3′ (160-bp product) (Invitrogen). PCR conditions for human IL-7 and β2-microglobulin were: 10 min at 94°C (1 cycle); 94°C for 1 min, 50°C for 45 s, 72°C for 1 min 15 s (5 cycles); 94°C for 1 min, 55°C for 30 s, 72°C for 1 min 15 s (29 cycles); 72°C for 5 min (1 cycle). PCR conditions for mouse IL-7 and β2-microglobulin were: 15 min at 95°C (1 cycle); 94°C for 30 s, 55°C for 30 s, 72°C for 30 s (35 cycles); 72°C for 10 min (1 cycle). cDNA was amplified for detection of CD19, EBF, Pax-5, and GAPDH (housekeeping gene) using the LightCycler 1.0 system real-time thermal cycler and the LightCycler FastStart DNA MasterPLUS SYBR Green kit (Roche Applied Science). The small numbers of B lineage cells produced in the absence of IL-7 activity precluded quantitative or semiquantitative assessment of mRNA levels. The assessment of samples as positive for expression was based on 1) observing reproducible cycle threshold (CT) values in two replicates of the target gene where the GAPDH housekeeping gene showed a CT value of <30 cycles, and 2) melting curve analysis showing superimposable melting curves across samples (including pre-B ALL cells as a positive control) and replicates for a given target gene in the absence of a superimposable product in negative control samples. Gene-specific primer pairs were designed to span introns using Roche’s Assay Design Center (www.roche-applied-science.com). Primers were as follows: GAPDH forward, 5′-GAG TCC ACT GGC GTC TTC AC; GAPDH reverse, 5′-GTT CAC ACC CAT GAC GAA CA; CD19 forward, 5′-TCC ACC TGG AGA TCA CTG CT; CD19 reverse, 5′-GAC CTT CCA GCC ACC AGT C; Pax-5 forward, 5′-GTC CCA GCT TCC AGT CAC AG; Pax-5 reverse, 5′-GTG CTC ACC GAG GAC ACC; EBF forward, 5′-AGC TGC CAA CTC CCC CTA T; EBF reverse, 5′-GGG AGG CTT GTG GAG GAG. Cycling parameters for all products were: initial denaturation of 15 min at 95°C followed by 50 cycles of 10 s at 95°C (denaturing); 5 s at 60°C (annealing); 15 s at 72°C (elongation). In flow cytometry analysis, CD19+ B lineage cells and CD34+ HSC and progenitor populations were identified based on light scatter within a lymphocyte/progenitor light scatter gate and by expression of indicated surface markers. CD19−CD34− non-B lineage cells were identified based on light scatter within a living cell light scatter gate. Gates for determining percentages of cells positive for surface or intracellular markers were set on similarly gated CD19+ B lineage and CD19− cells in samples costained for CD19 and isotype-matched control Abs. Absolute numbers of culture progeny were determined by multiplying the fraction of cells within a particular subset (gated based on surface immunophenotype; for example, CD19−, CD19+, CD19+CD34+IL-7Rα+) as a percentage of the cells within living cell light scatter (assessed by flow cytometry) by the total count of living cells generated in the culture (determined by hemocytometer count of cells negative for trypan blue staining or by flow cytometry using Caltag counting beads (Caltag Laboratories)). Relative numbers of cells were determined by dividing the absolute number of cells of a particular type generated in each experimental condition by the absolute numbers of the same type of cells generated under control conditions (as in Figs. 1⇓ and 2⇓) or under control conditions plus anti-human IL-7 neutralizing Abs (as in Figs. 3⇓ and 8⇓) in each independent experiment. Exogenous IL-7 increases B cell production in human-only culture, but not in hybrid human-mouse cocultures, with murine stromal cell lines. A, CB CD34+ cells that were negative for lineage markers (Lin−CD34+) were FACS sorted and placed in coculture with murine S17 stroma (left panels) or with sublethally irradiated, primary stroma from adult human BM (middle and right panels). Cocultures were supplemented with IL-3 (first week only) and Flt3 ligand (3, F; control conditions), with or without the addition of IL-7 (5 ng/ml). Cells generated in cultures without IL-7 (B) or with IL-7 (C) were harvested at 3 or 5 wk and stained for flow cytometry to assess for surface expression of the B lineage marker, CD19, and the presence of Ig H chain protein (cμ) in the cytoplasm or surface IgM as indicated. Plots are gated on lymphocyte light scatter (gates not shown). CD19+ B lineage cells, as a percentage of the total cells in living cell light scatter (mean ± SEM) for four independent experiments (see Materials and Methods), are given in left and middle panels. Percentages of IgM+ cells (mean ± SEM) among total CD19+ cells at 5 wk are given in right panels (eight independent experiments). D, Hybrid S17 (left panel) and human-only cultures (right panel) established under control conditions (3, F) as described above were supplemented with stem cell factor (S), with IL-7 (7) or with a combination of IL-7, and stem cell factor and harvested at 3 wk. Relative numbers of CD19+ and CD19− progeny were determined as described in Materials and Methods. Data shown are the means ± SEM of six independent experiments. ∗, p = 0.012, ANOVA). E, Hybrid S17 (left panel) and human-only cultures (right panel) initiated as described above were supplemented with increasing amounts of IL-7 as indicated. At 3 wk culture progeny were harvested and relative numbers of CD19− and CD19+ cells were determined. Data shown are the means ± SEM of three independent experiments with the exception of IL-7 at 100 ng/ml, for which n = 2. B cell production in hybrid human-mouse cocultures is dependent on murine IL-7 activity. FACS-sorted Lin−CD34+ CB cells were placed in hybrid cocultures with the murine S17 or MS-5 stromal cell lines and grown under control conditions (3, F) or control conditions supplemented with increasing amounts of anti-mouse IL-7 neutralizing Ab or appropriate control Ab. Culture progeny were harvested at 3 wk and absolute numbers of CD19+ and CD19− cells were determined as described in Materials and Methods. Absolute numbers of (A) CD19+ and (B) CD19− progeny generated under increasing control and anti-IL-7 Ab concentrations were compared with absolute numbers of CD19+ and CD19− cells generated under control conditions with no Ab. Relative numbers of CD19+ and CD19− cells (as compared with control conditions with no Abs) are graphed. Data shown are the means ± SEM for three independent experiments. C, RT-PCR analysis using primers to detect IL-7 and β2-microgloblin (Β2m, ubiquitously expressed in nucleated cells). Analyses from three different adult mice (age range, 6–12 wk) from the murine S17 and MS-5 stromal cell lines (n = 2) and from three different adult human donors (age range, 20–30 years) are shown. D, ELISA assessment of in vitro IL-7 production from indicated stromal cell lines (murine MS-5 and S17) or primary stroma. Stroma were plated under conditions similar to those used for cocultures (3500 nonirradiated MS-5 or S17 cells/well and 7000 sublethally irradiated primary human stroma/well in 96-well plates). For comparison, nonirradiated primary human stroma were also plated at 3500 cells/well. Media were harvested at weekly time points and assessed for IL-7 by ELISA. Note the difference in threshold for sensitivity of mouse and human IL-7 ELISA assays (murine, 3.5–8.3 pg/ml; human, <0.1 pg/ml). Primary adult murine BM stroma was also assessed for IL-7 production; however, data are not shown, as the levels of IL-7 production for both irradiated and nonirradiated primary adult murine BM stroma were below the sensitivity of the murine IL-7 ELISA. B cell production from adult BM HSCs is profoundly dependent on IL-7. Human-only cultures were initiated with FACS-sorted Lin−CD34+ HSCs from CB or BM under control (3, F) culture conditions (see Fig. 1) supplemented with exogenous human IL-7 or with neutralizing anti-human IL-7 Abs as indicated. At 3 wk, culture progeny were harvested, counted, and stained for flow cytometry to detect expression of the B lineage marker CD19. A, Plots shown are gated on lymphocyte light scatter (gates not shown) and display equal numbers of cells. CD19+ B lineage cells as a percentage of the total cells in living cell light scatter (mean ± SEM) for six independent experiments are given. B, Relative numbers of CD19+ and CD19− culture progeny at 3 wk were determined as described in Materials and Methods. Data graphed are the increases in relative numbers of CD19+ and CD19− cells in cultures supplemented with exogenous IL-7 as compared with cultures supplemented with anti-IL-7 neutralizing Abs. ∗, p < 0.05, two-tailed paired t test. C, Shown are CD19+ and CD19− generative capacities of CB and adult BM (donor age 20–30 wk) HSCs under indicated conditions. Generative capacity was determined by dividing the absolute numbers of CD19+ or CD19− progeny generated at 3 wk by the number of Lin−CD34+ HSCs plated at culture initiation. Data shown in C are the means ± SEM of six independent experiments. ∗∗, p < 0.01, two-tailed Mann-Whitney U test. Each independent coculture experiment represents an independent FACS sort of Lin−CD34+ BM or CB cells. In most cases adult BM in independent experiments is from different donors, and in all cases CB in each independent experiment is pooled from multiple different donors. The hematopoietic cells for all conditions in each independent experiment were aliquoted from a pool of cells FACS sorted at the same time from the same donor(s). Flow cytometry analysis was performed using FlowJo software (Tree Star). Statistical analysis was performed using InStat3 software (GraphPad Software). We developed a novel, human-only in vitro model of B cell development based on coculturing nonfetal human hematopoietic progenitors with primary human stroma from adult BM (Fig. 1⇑A). Initial experiments used CB as a source of HSCs. While CB contains fetally generated B cells, the stem cells present in CB are of interest because they give rise to B cells in the neonatal period and are increasingly used clinically as a source of HSCs for transplant. B cell production in human-only cultures was compared with that in an established hybrid coculture model (45, 47, 48, 49) consisting of human HSCs and murine S17 stroma (Fig. 1⇑A). The emergence of human B lineage cells in human-only cultures paralleled that observed in hybrid cultures with murine S17 stroma. CD19+ B lineage cells were undetectable at 1 wk and rare at 2 wk (data not shown). At 3 wk, CD19+ B lineage cells were detectable in both human-only and hybrid S17 cultures under control conditions. However, the frequency of B lineage cells was low in human-only cultures (Fig. 1⇑B, middle panel). With the addition of human IL-7, human-only cultures produced a substantial population of CD19+ cells (Fig. 1⇑C, middle panel). At 3 wk, the CD19+ B lineage cells present in human-only cultures, like those in hybrid cultures, were B cell precursors that did not express the cμ Ig H chain (Fig. 1⇑, B and C, middle and left panels) or surface Ig as evidenced by the absence of κ and λ Ig light chains (data not shown). At 5 wk, surface IgM+ cells were observed in both human-only (Fig. 1⇑, B and C, right panels) and hybrid cocultures (data not shown), and while the production of cμ+ and IgM+ B cells in human-only cultures was inefficient (∼11–16% of CD19+ cells), it was consistently higher than that observed in hybrid cocultures (∼3% of CD19+ cells). These data provide evidence that cocultures with primary human BM stromal cells support the production of human B cells and establish human-only cultures as an in vitro model for studying early stages of human B lymphopoiesis. Using human-only and hybrid S17 cultures we characterized the effect of IL-7 on the production of human B cell precursors from CB HSCs. The addition of IL-7 to human-only, but not hybrid, S17 cultures significantly increased the production of CD19+ B lineage cells as compared with cultures without IL-7 (Fig. 1⇑, B–D). Stem cell factor had no significant effect on human B cell production either alone or in combination with IL-7 in human-only or hybrid S17 cultures (Fig. 1⇑D). Thus, human-only cultures revealed specific IL-7 effects on human B cell production. A titration of IL-7 into human-only cultures showed that IL-7-induced increases in the production of B lineage cells were dose-dependent and specific to CD19+ cells, achieving maximal effects (43-fold) at 10 ng/ml IL-7 (Fig. 1⇑E). In contrast, IL-7-induced increases observed in hybrid S17 cultures at 3 wk never averaged >3-fold at any concentration of IL-7 (Fig. 1⇑E). These data provide evidence that IL-7 induces a lineage-specific increase in the in vitro production of human B cell precursors that is not detectable in hybrid cultures with the murine S17 stromal cell line. To determine whether the inability to support IL-7-induced increases in human B cell production is specific to murine S17 stroma, we examined IL-7 effects in hybrid cultures with the MS-5 murine stromal cell line, another established model (42, 50, 51) for in vitro human B lymphopoiesis. As with S17 stroma, the addition of IL-7 did not significantly increase the production of human B cell precursors in hybrid MS-5 cultures (data not shown). However, substantial numbers of human B lineage cells were produced in the absence of exogenous IL-7 in hybrid cultures with murine S17 and MS-5 stroma (Fig. 1⇑B and data not shown), suggesting that another factor replaces human IL-7 in hybrid human-mouse cocultures. While early studies suggested that mouse IL-7 does not act on human cells (52, 53), more recent reports indicate that this is not the case (22, 38). A titration of anti-mouse IL-7 neutralizing Abs, but not control Abs, into hybrid cultures with murine stroma gave a dose-dependent reduction in human B cell production. At the highest concentrations, anti-mouse IL-7 neutralizing Abs decreased B cell production from CB HSCs in hybrid S17 and MS-5 cultures by 10- and 17-fold, respectively, as compared with cocultures with no neutralizing Ab (Fig. 2⇑A). The production of non-B lineage (CD19−) cells was not affected by anti-mouse IL-7 neutralizing Abs (Fig. 2⇑B). These data provide evidence that endogenously produced murine IL-7 is critical for the production of human B cell precursors in hybrid cocultures with murine S17 and MS-5 stroma. To determine whether stromal cells can serve as a source of IL-7 for in vivo human B cell development, we examined the ability of primary human BM stroma to produce IL-7. IL-7 mRNA was detected in primary adult human BM stroma as well as in primary murine BM stroma and murine stromal cell lines (Fig. 2⇑C). Next, we compared the levels of IL-7 protein produced by murine and human stroma grown as in cocultures. Weekly assessment of IL-7 by ELISA showed that primary adult human BM stroma produce low levels of IL-7 in vitro (ranging from 0.15 to 1.02 pg/ml during a 5-wk culture period) and that IL-7 production is not affected by sublethal irradiation before plating for coculture. In contrast, the murine S17 and MS-5 stromal cell lines produced levels of IL-7 that were at least 40-fold higher than those of primary human BM stroma (Fig. 2⇑D). However, in vitro IL-7 production by primary adult murine BM stroma, either with or without sublethal irradiation, was below the threshold of detection by the ELISA for mouse IL-7. Thus, the high level of in vitro IL-7 production by murine S17 and MS-5 murine stromal cell lines does not reflect that of primary murine BM stroma that support in vivo IL-7-dependent B cell development in the mouse. While the production of IL-7 from primary adult human BM stroma was detectable with the much more sensitive ELISA assay for human IL-7, those levels would have been below the sensitivity of the mouse IL-7 ELISA assay. These data provide evidence that primary human adult BM stroma produce IL-7 and that the level of in vitro IL-7 production by these cells is consistent with that observed for mouse, an animal model where the physiological relevance of IL-7 in B cell development has been demonstrated in vivo (11, 32). To determine the extent to which B cell production is dependent on IL-7 and how this might change during ontogeny, we compared the production of B cell precursors from CB and adult BM HSCs in human-only cultures supplemented with anti-human IL-7 neutralizing Abs or with IL-7 (Fig. 3⇑A). A small population of CD19+ B lineage cells was generated from CB HSCs in cultures where IL-7 activity was neutralized. In contrast, B lineage cells derived from adult human BM were almost totally absent from cultures with anti-IL-7 Abs (Fig. 3⇑A). These data suggest that HSCs in CB but not adult BM have the potential for IL-7-independent human B lymphopoiesis. A comparison of human-only cultures initiated with CB and adult BM HSCs showed that IL-7-induced increases in both cases were similar in magnitude and specific to CD19+ cells (Fig. 3⇑B). However, the fraction of culture progeny comprised of B lineage cells was significantly less in cultures with HSCs from adult BM (Fig. 3⇑A). Therefore, we compared the generative capacities of CB and BM HSCs with respect to B lymphoid (CD19+) and non-B lymphoid (CD19−) progeny and the effects of IL-7 on these capacities (Fig. 3⇑C). For each Lin−CD34+ CB cell plated at culture initiation, an average of 5.7 CD19+ cells were generated at 3 wk in human-only cultures with IL-7. Surprisingly, the average B lymphoid generative capacity of adult BM HSCs in identical conditions was only 0.11 CD19+ cells per HSC plated. The capacities of CB and adult BM HSCs to generate CD19− progeny were not significantly different and were unaffected by IL-7. Thus, the in vitro B lymphoid generative capacity of adult BM HSCs is >50-fold less than that of CB HSCs, and this decreased generative capacity is specific to CD19+ cells. These data suggest that IL-7 is more critical in maintaining human B cell production during adult life than during the neonatal period and that this may be due in part to a selective decrease in the B lymphoid generative capacity of HSCs in adult BM as compared with CB. Studies of mouse B cell development suggest that TSLP, a cytokine that signals through the IL-7Rα and/or Flt3 ligand, supports the production of fetal/neonatal B cells in the absence of IL-7 (4, 54). Therefore, we examined the extent to which the IL-7-independent production of B lineage cells from CB HSCs in our human-only cultures (Fig. 3⇑A, left panel) is dependent on Flt3 ligand and TSLP. The production of CD19+ cells from CB HSCs in human-only cultures supplemented with Flt-ligand and anti-IL-7 was compared with that observed with neutralizing anti-Flt3 ligand, neutralizing anti-TSLP, or both. As shown in Fig. 4⇓A, the addition of anti-TSLP Abs had no effect on IL-7-independent production of B lineage cells, while CD19+ B lineage cells were essentially absent in cultures that contained anti-Flt3 ligand. These data show that Flt3 ligand, but not TSLP, is required for the IL-7-independent production of B lineage cells from CB HSCs that we observed in human-only cultures. IL-7-independent production of human B lineage cells is dependent on Flt3 ligand and produces CD19+ B lineage cells that can respond to IL-7. A, Human-only cultures were initiated with FACS-sorted Lin−CD34+ HSCs from CB and grown with indicated cytokines (+), with cytokine-specific neutralizing Abs (anti-), or without the indicated cytokine or its neutralizing Ab (---). Corresponding isotype control Abs were added to all wells in which a specific neutralizing Ab was not used but are not indicated in the graph (see Materials and Methods). At 3 wk, culture progeny were harvested, counted, stained for CD19 expression, and the CD19+ generative capacity was determined as described in the Fig. 3 legend. Data in A are the means ± SEM of two independent experiments with three replicates per experiment. ANOVA, ∗∗∗, p < 0.001 for Bonferroni multiple comparisons posttest. B and C, Human-only cultures were initiated with FACS-sorted Lin−CD34+ HSCs from CB under control (3, F) culture conditions and supplemented with exogenous human IL-7 or with neutralizing anti-human IL-7 Abs. After 3 wk, culture progeny were harvested and then switched to a second human-only culture for 3 days under indicated culture conditions (IL-7 to IL-7, anti-IL-7 to anti-IL-7, or anti-IL-7 to IL-7). After 3 days, switch cultures were harvested, stained to detect CD19, and the level of CD19 expression (B) and the size (as indicated by FSC, C) of gated CD19+ B lineage cells were determined by flow cytometry analysis. Hisotgrams depicting CD19high and FSChigh gates from a representative experiment are shown. D, Percentages of total CD19+ cells that fall within CD19HI and FSCHI gates (mean ± SEM) for six independent experiments. ∗, p > 0.05; ∗∗, p > 0.01; ∗∗∗, p > 0.001, two-tailed paired t test. IL-7 has been reported to increase the expression of CD19 on fetally derived human B cell precursors (55), and in the presence of IL-7, IL-7Rα+ B cell precursors are larger in size than B cell precursors that lack the IL-7Rα (22). Consistent with this report, flow cytometry analysis showed that the B lineage cells generated from CB and BM HSCs in human-only cultures expressed high levels of CD19 in the presence of IL-7, while cultures supplemented with anti-IL-7 neutralizing Abs expressed much lower levels of CD19 (Fig. 3⇑A). Human-only cultures supplemented with IL-7 also showed higher frequencies of B cells that were larger (as indicated by increased FSC in flow cytometry analysis) as compared with those produced in cultures with anti-IL-7 neutralizing Abs (see below). To determine whether the B lineage cells generated in the absence of IL-7 were capable of responding to IL-7 by up-regulating CD19 and exhibiting increased cell size characteristic of cycling cells, we switched the culture progeny produced from CB HSCs in human-only cultures supplemented with anti-IL-7 neutralizing Abs to human stromal cell cultures with IL-7 (anti-IL-7 to IL-7 switch cultures). After 3 days, anti-IL-7 to IL-7 switch cultures were compared with cultures that had been switched to human stroma and anti-IL-7 (anti-IL-7 to anti-IL-7 switch cultures) or to human-only cultures that had been both initiated with and switched to IL-7 supplementation (IL-7 to IL-7 switch cultures). The percentage of cells expressing high levels of CD19 (CD19HI) was increased in anti-IL-7 to IL-7 switch cultures (Fig. 4⇑B, middle panel), as compared with anti-IL-7 to anti-IL-7 switch cultures (Fig. 4⇑B, top panel); however, the percentages were not as high as those observed among B lineage cells that were produced under continuous exposure to IL-7 (Fig. 4⇑B, bottom panel, and D). Cultures with B cell precursors that were never exposed to IL-7 (anti-IL-7 to anti-IL-7 switch cultures) showed a low frequency of cells with the high levels of FSC characteristic of cycling cells. The switch from anti-IL-7 to IL-7 resulted in a significant increase in the frequency of cells that were FSCHI and a FSC histogram profile that was similar to that seen for IL-7 to IL-7 switch cultures. IL-7R signaling, partially via up-regulation of EBF, has been reported to be a regulator of the transcription factor network that controls B cell development in the mouse (2). Expression of EBF in the absence of IL-7 in fetal and neonatal mice allows IL-7-independent B cell differentiation at early points in ontogeny (9). Therefore, we were interested in examining expression of EBF and its downstream target PAX-5 (56) in the early B lineage cells generated in our human-only cultures. CD19+ cells generated in switch cultures were FACS sorted for RT-PCR. Real-time RT-PCR showed that B lineage cells generated in all three switch culture conditions expressed mRNA for CD19, PAX-5, and EBF (supplemental Fig. 1),4 but the small number of cells generated in cultures initiated with anti-IL-7 precluded a quantitative comparison of mRNA levels. Taken together, these data provide evidence that the CD19LO cells generated from CB HSCs in the absence of IL-7 are B lineage cells and have the capacity to respond to subsequent IL-7 stimulation. To identify the cellular targets of IL-7 we used flow cytometry to examine IL-7Rα expression among cells present during in vitro B lymphopoiesis (Fig. 5⇓A). IL-7Rα was not detectable on primary human BM stromal cells used in cocultures (Fig. 5⇓B). Approximately 35% of CD19+ B cell precursors produced in coculture expressed the IL-7Rα, regardless of whether they arose from HSCs in CB or adult BM or whether IL-7 was present (Fig. 5⇓, C and D, right panel). We gated CD19− cells into a CD34− subset that included more mature non-B lineage cells and into a CD34+ subset that included HSCs and progenitors present in the 3-wk human-only cultures. Of the CD19−CD34− non-B lineage cells generated from CB and BM HSCs in human-only cultures, 3–12% expressed the IL-7Rα (Fig. 5⇓C, left panel), while 4–14% of the of the CD19−CD34+ HSC and progenitor subset was IL-7Rα+ (Fig. 5⇓C, middle panel). The percentage of cells in each subset that expressed IL-7Rα was not significantly different in cultures initiated with CB and BM HSCs, and the presence or absence of IL-7 activity had no significant impact on the percentage of cells expressing the IL-7Rα in any of the subsets (Fig. 5⇓D). These data show that CD19+ B cell precursors represent the major IL-7Rα+ population in human-only cultures and are therefore a potential IL-7 target during in vitro B cell development. IL-7 directly targets B lineage cells. A, Human-only cultures were initiated with FACS-sorted Lin−CD34+ HSCs from CB or BM under control conditions (3, F) and supplemented with anti-IL-7 neutralizing Abs or exogenous human IL-7. At 3 wk, culture progeny were harvested and stained for flow cytometry to detect coexpression of CD19, IL-7Rα, and CD34. Cells were gated into CD19+, CD19−CD34−, and CD19−CD34− subsets as indicated. Plot shown is from a CB culture with IL-7. B, Flow cytometry analysis of IL-7Rα expression among primary human BM stromal cells used in human-only cultures. Data are representative of flow cytometry analysis of stroma from three different donors. C, Flow cytometry analysis showing IL-7Rα vs CD19 expression for human-only cultures of CB or BM HSCs supplemented with IL-7. Insets, Isotype Ab control vs CD19 staining. Plots are gated on lymphocyte light scatter (gates not shown) and display equal numbers of cells. D, The percentages of cells in indicated subsets (gated as shown in A) that express IL-7Rα are graphed. Data are from 3-wk human-only cultures of CB and BM HSCs supplemented with anti-IL-7 or IL-7 as indicated. Percentages are the means ± SEM of five (CB) or three (BM) independent experiments with eight and six total replicates, respectively. E, Human-only cultures were initiated with CD34+ HSCs from CB under control conditions supplemented with exogenous human IL-7. At 3 wk, culture progeny were harvested and CD19+ B lineage cells were isolated by magnetic separation. Aliquots of purified B cell precursors were costained for expression of CD19 and IL-7Rα or with isotype-matched control Abs (left panel). Plots shown are gated on events falling within lymphocyte light scatter. Quadrants were set based on isotype control staining (inset), and percentages of cells in each quadrant are shown. The remaining purified precursors, after a minimum of 3 h removal from IL-7, were incubated with or without exogenous human IL-7 for 1 h and then stained for flow cytometry with an Ab to detect phosphorylated STAT5 or an isotype-matched control Ab as describe in Materials and Methods. The percentage of cells positive for phospho-STAT5 staining, based on isotype control staining (overlay), are shown (right panel). Data shown are representative of two independent experiments. To determine whether IL-7 acts directly on B cell precursors we used flow cytometry to assess phosphorylation of STAT5, an event downstream of IL-7R signaling (35). CD19+ B cell precursors were isolated from human-only cultures and assessed by flow cytometry for purity (based on CD19 expression) and for IL-7Rα expression (Fig. 5⇑E, left panel) and then for STAT5 phosphorylation following incubation with or without IL-7 (Fig. 5⇑E, right panel). Phosphorylated STAT5 was detected in B cell precursors incubated with IL-7, but not in B cell precursors cultured without IL-7 (Fig. 5⇑E, right panel). The percentage of B cell precursors positive for phosphorylated STAT5 following incubation with IL-7 was virtually identical to the percentage of cells expressing IL-7Rα (Fig. 5⇑E, compare left and right panels). These data provide evidence that B cell precursors are directly targeted by IL-7 in human-only cultures. To determine whether increased cell survival is involved in the IL-7-induced increases observed in our cocultures, we examined the effect of IL-7 on apoptosis among culture-generated human B cell precursors. Human-only cultures initiated with CB HSCs were harvested at 3 wk and CD19+ cells (either enriched or unseparated from CD19− cells) were placed in coculture with fresh human stroma and supplemented with anti-IL-7 neutralizing Abs, control Abs, or IL-7. Cells were harvested at daily time points, and flow cytometric analysis of staining with the annexin V apoptosis indicator was used to determine the percentages of CD19+ B cell precursors undergoing apoptosis. IL-7 had no effect on the percentages of CD19+ that were annexin V+, whether they were in coculture alone or together with CD19− cells (data not shown). Similarly, IL-7 had no effect on apoptosis among in vivo-generated B cell precursors (CD19+K/L−) that were FACS sorted from adult BM and assessed in identical assays (data not shown). These results suggest that IL-7 does not mediate protection from apoptosis and that increased survival of CD19+ B cell precursors is unlikely to be a major mechanism by which IL-7 increases human B cell production. To determine whether increased proliferation is a mechanism for IL-7-induced increases in human B cell production, we used flow cytometry to examine expression of the Ki-67 proliferation Ag in cells harvested from human-only cultures supplemented with IL-7 or with anti-IL-7 neutralizing Abs (Fig. 6⇓A). 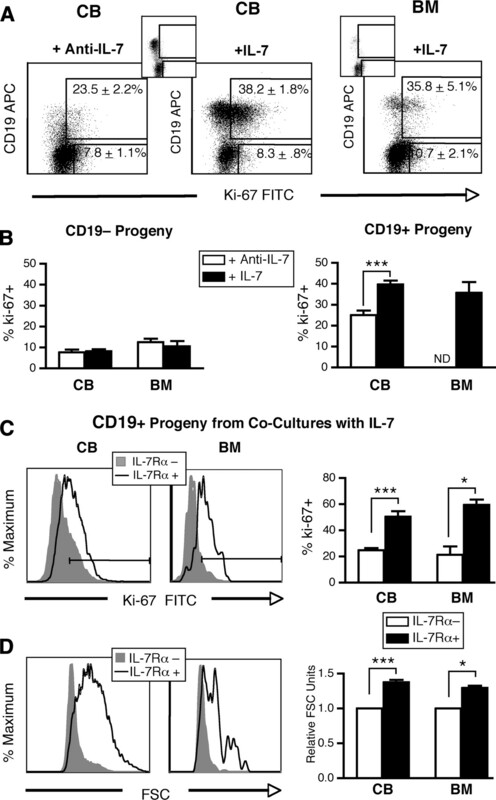 IL-7 did not change the percentage of CD19− cells that were Ki-67+ in cultures of CB or BM HSCs (Fig. 6⇓, A and B). In contrast, in CB cultures the percentage of CD19+ cells expressing the Ki-67 was significantly higher with IL-7 supplementation (Fig. 6⇓B). Cultures of BM HSCs generated too few B cell precursors to be assessed for Ki-67 when anti-IL-7 Abs were added. However, the percentage of B cell precursors expressing Ki-67 was the same in CB and BM cultures with IL-7 (Fig. 6⇓, A and B). IL-7-induced increases in the production of B lineage cells are mediated through increased proliferation. Human-only cultures were initiated with FACS-sorted Lin−CD34+ HSCs from CB or BM under control conditions (3, F) and supplemented with anti-human IL-7 neutralizing Abs or with exogenous human IL-7. At 3 wk, culture progeny were harvested, counted, and stained for surface expression of IL-7Rα and/or the B lineage marker CD19. Surface-stained cells were fixed, permeabilized, and stained with an Ab specific to the Ki-67 proliferation Ag or an isotype-matched control Ab. A, The plots shown are gated on living cell light scatter and display equal numbers of cells. Gates shown were set based on isotype control staining among CD19+ and CD19− cells (insets). B, Percentages of CD19− (left panel) and CD19+ cells (right panel) positive for the Ki-67 proliferation Ag (mean ± SEM) for five (BM) and eight (CB) experiments. In cocultures with BM HSCs and with anti-IL-7 neutralizing Abs, too few B cells were generated to assess Ki-67 expression (ND, not done). C and D, At 3 wk, cocultures supplemented with IL-7 were harvested, counted, and stained for surface expression of IL-7Rα and/or the B lineage marker CD19. Surface-stained cells were fixed, permeabilized, and stained with an Ab specific to the Ki-67 proliferation Ag or an isotype-matched control Ab. C, The expression of Ki-67+ among gated CD19+IL-7R− and CD19+IL-7R+ cells (gates not shown) are plotted in histograms (left panels) and graphed (right panel). D, The FSC (an indicator of cell size) of gated (gates not shown) CD19+IL-7R− (shaded) and CD19+IL-7R+ (overlay) cells are plotted in histograms (left panels). The relative FSC of CD19+IL-7R+ cells as compared with CD19+IL-7R− cells is graphed in the right panel. Data shown in C and D are the means ± SEM for five (CB) or three (BM) independent experiments. ∗, p < 0.05; ∗∗∗, p < 0.001, paired t test. To verify that the increases in proliferation observed in cultures supplemented with IL-7 were due to the direct action of IL-7 on B cell precursors, we compared Ki-67 expression (Fig. 6⇑C) and size (indicated by FSC, Fig. 6⇑D) in IL-7Rα+ and IL-7Rα− B cell precursors generated in cultures with IL-7. For both CB and BM cultures, average cell size and the percentages of cells expressing Ki-67 were significantly higher for IL-7Rα+ than for IL-7Rα− B cell precursors. These data provide further evidence that IL-7 increases the production of human B lineage cells through increased proliferation due to direct targeting of B cell precursors by IL-7. To determine whether the IL-7 targets that we identified in our human-only cultures are reflective of human B cell development in vivo, we examined the expression of the IL-7Rα in early B lineage cells that were generated in vivo in adult human BM. The average frequency of IL-7Rα+ cells among in vivo-generated B cell precursors (CD19+K/L−) in adult human BM (Fig. 7⇓A and Table I⇓) was similar (32%) to that observed for B cell precursors generated in vitro (35%) from HSCs in CB and adult BM in human-only cultures (Fig. 5⇑, C and D). The percentages of in vivo-generated CD19+K/L− B cell precursors that we assessed in human subjects (Table I⇓) exhibited a broad range in the percentage of cells that were IL-7Rα+ (17–56%) and showed no obvious correlation with age, gender, or race, suggesting that there is substantial natural variation among adult individuals. Thus, the IL-7Rα+ population of B cell precursors observed in human-only cultures is reflective of in vivo B cell development in adult human BM and suggests a physiological role for IL-7 in human B cell development. The distribution of IL-7Rα+ cells in adult human B cell precursor populations produced in vivo. A, Primary adult human BM mononuclear cells, either fresh or frozen and then thawed, were stained for flow cytometry to assess coexpression of CD19, the κ and λ light chains, IL-7Rα, and either CD34 or the cμ Ig H chain. CD19+ B lineage cells falling within lymphocyte light scatter (gates not shown) that were negative for the κ and λ light chains (CD19+K/L−) were gated as shown (left panel), and the percentage of cells expressing of IL-7Rα was determined (right panel, n = 10). B, CD19+K/L− cells were gated into a CD34+ and CD34− subsets (n = 7) or into cμ− and cμ+ subsets (n = 2). Percentages of total CD19+K/L− or of the cells in each subset that were IL-7Rα+ are graphed. Percentages are the means ± SD from the indicated numbers of donors. A substantial portion of the B cell precursors generated in human-only cultures initiated with CB and BM HSCs were IL-7Rα−. This was also the case for CD19+K/L− cells in adult BM. To determine whether the expression of IL-7Rα correlated with the expression of developmental markers during in vivo B cell differentiation, we examined IL-7Rα expression among developmental subsets of CD19+K/L− B cell precursors identified based on expression of CD34+ or cμ (Fig. 7⇑B). The percentages of IL-7Rα+ cells were similar for all developmental subsets (cμ+, cμ−, CD34−−, and CD34+) of CD19+K/L− cells. Thus, the expression of IL-7Rα among B cell precursors produced in vivo does not appear to correlate with particular stages of development that can be identified based on expression of CD34 or with successful rearrangement of the Ig H chain as indicated by the expression of cμ (Fig. 7⇑B). In the mouse, IL-7R signaling has been associated with distinct differentiation and proliferation signals. Thus, while the expression of IL-7Rα may not correlate with markers of development in CD19+ B cell precursors, it is possible that IL-7 may directly target distinct developmental populations of IL-7Rα+ B lineage precursors for proliferation or for differentiation. To identify the developmental targets of IL-7-induced proliferation we examined IL-7-induced increases and expression of the Ki-67 proliferation Ag in four subsets that included developmentally sequential populations of B cell precursors. FACS analysis of the cells present at 3 wk in human-only cultures was used to identify four populations (Fig. 8⇓A): 1) the most primitive IL-7R− HSCs and progenitors (HSC) through which IL-7 effects might be indirectly mediated, 2) IL-7Rα+ progenitors (IL-7R+ P) that would include the earliest CD19− lymphoid-committed progenitors that express the IL-7Rα (57, 58), 3) CD34+ pro-B cells (CD34+ B), and 4) CD34− pro-B cells (CD34− B). Precursor populations targeted by IL-7-induced expansion. A, Flow cytometry analysis of human-only cultures was used to identify four subsets of cells that include developmentally sequential precursors to mature B cells: HSCs and IL-7R− progenitors (HSC), IL-7R+ progenitors (IL-7R+ P), CD34+ pro-B cells (CD34+ B), and CD34− pro-B cells (CD34− B). Surface immunophenotypes used to identify each population in human-only cultures are indicated at the bottom of the panel. Human-only cultures initiated with Lin−CD34+ cells from CB and BM and supplemented with anti-IL-7 or with exogenous IL-7 were harvested at 3 wk and counted and stained for flow cytometry to detect surface CD19, CD34, IL-7Rα, and an additional surface or intracellular marker. Cells in each subset were gated as shown in Fig. 5, A and C, and based on isotype control staining. B, Relative numbers of cells in each subset were determined as described in Materials and Methods. Data graphed are the increases in relative numbers of cells in each subset in cultures supplemented with exogenous IL-7 as compared with cultures supplemented with anti-IL-7 neutralizing Abs. Data shown are from three independent experiments and six total replicates. C, The percentages of cells in each gated subset that are positive for expression of the Ki-67 proliferation Ag are graphed. Data shown are the means ± SEM obtained from three to seven independent experiments. D, The ability of CB and BM Lin−CD34+ cells to generate cells in each subset under indicated conditions was determined by dividing the absolute numbers of progeny in each subset, generated at 3 wk, by the number of Lin−CD34+ HSCs plated at culture initiation. Data shown were obtained from three independent experiments and six total replicates (HSC, IL-7R+ P) or from six independent experiments (CD34+ B and CD34− B). ∗, p < 0.05; ∗∗, p < 0.01; ∗∗∗, p < 0.001; ∗∗∗∗, p < 0.0001, two-tailed paired t test. Human-only cultures initiated with Lin−CD34+ cells from CB and BM and supplemented with IL-7 showed significantly increased numbers of cells in the CD34+ B and CD34− B subsets at 3 wk when compared with cultures with anti-IL-7. The relative numbers of CD34+ B cells increased by only 5- to 14-fold (CB and BM cultures, respectively) when IL-7 was present, while CD34− B cells went up by 194- to 90-fold (CB and BM cultures, respectively). In contrast, the relative numbers of HSCs and IL-7R+ P were not significantly increased in cultures with IL-7 (Fig. 8⇑B). Consistent with the IL-7 effects that we observed on cell numbers, CB cultures supplemented with IL-7 showed significantly higher percentages of Ki-67+ cells among the CD34+ B and CD34− B subsets, but not among the HSC or IL-7R+ P subsets (Fig. 8⇑C). The percentage of Ki-67+ B cells among CD34− B cells in BM cultures was similar to that observed in CB cultures; however, there were too few CD19+ cells to assess in Ki-67 expression in any BM cultures with anti-IL-7 or in the CD34+ B cells in BM cultures where IL-7 was present (Fig. 8⇑C, right panel). Taken together, these data provide evidence that IL-7 targets both CD34+ and CD34− pro-B cells for increased proliferation. In contrast, in our culture model we were unable to detect any significant changes in proliferation due to IL-7 effects among developmental subsets that would include CD19− B cell precursors. In Fig. 3⇑ we showed that IL-7 is particularly critical for the production of B lineage cells from adult BM because the capacity of adult BM to generate B lineage cells is greatly reduced as compared with CB. To get a better understanding of the dynamics and potential mechanisms that might be responsible for the changes in B cell development that occur during ontogeny, we compared the ability of CB and adult BM to generate the developmental subsets observed in vitro in human-only cultures. In cultures with adult BM the HSC generative capacity was about half, and the IL-7R+ P generative capacity was ∼10-fold less than that observed for CB cultures (Fig. 8⇑D, note the ×10 scale reduction in the right panel). In cultures with IL-7, the adult BM generative capacities for cells in the CD34+ B and CD34− B subsets were ∼40-fold and ∼50-fold less, respectively, than those observed for CB. While BM cultures generated detectable CD19− subsets, and the capacity to generate these cells was unaffected by IL-7, B lineage precursors that reached the CD19+ stage of development were essentially absent in cultures with anti-IL-7. These data suggest that there is a progressive loss of generative capacity during the course of B lineage differentiation in adult BM, as compared with CB, and that as a consequence of this reduced B lineage generative capacity, IL-7 is more critical for B cell development from HSCs in adult BM. Defining the role of IL-7 in human B cell development has been difficult for several reasons. First, most early studies of IL-7 and human B cell development used fetal hematopoietic sources. This is particularly relevant as subsequent murine studies revealed that IL-7-dependent B lymphopoiesis is linked with ontogeny: only in the adult mouse does B cell development become dependent on IL-7. Thus, differences in fetal and adult B cell development have been interpreted as fundamental differences in mouse and human B lymphopoiesis. Second, studies of humans that are defective in components of the IL-7R signaling pathway are hampered by limitations in the number, type, and quantity of specimens available for assessment of IL-7 function. Third, studies of nonfetal B lymphopoiesis were hampered by the lack of an in vitro model of human B cell development that reconstitutes the human BM stroma microenvironment without the confounding factors introduced by murine stromal cell lines. Herein we describe a novel human-only model of in vitro B cell development based on coculturing HSCs on primary human BM stroma. We used this model to examine the role of IL-7 in human B lymphopoiesis from HSCs in adult BM and from the HSCs in CB that give rise to B cells during the neonatal period. Using the human-only culture model, we show that IL-7 increases the production of human B cell precursors from HSCs in CB and adult BM by more than 60-fold as compared with cultures with anti-IL-7 neutralizing Abs (Fig. 3⇑). IL-7-induced increases were dose-dependent (Fig. 1⇑E), specific to CD19+ cells (Figs. 1⇑E and 5⇑), and were mediated through increased proliferation (Fig. 6⇑), but not increased cell survival (data not shown). Expression of the IL-7Rα and the induction of STAT5 phosphorylation following stimulation with IL-7 (Fig. 5⇑) indicate that IL-7 acts directly on CD19+cμ− cells present in 3-wk human-only cultures (Fig. 1⇑) to expand both the CD34+ and CD34− pro-B cell compartments (Fig. 8⇑). The IL-7-induced increases in B cell precursors that we observed in human-only cultures were not detectable in hybrid cultures where human HSCs were cocultured on murine S17 or MS-5 stromal cell lines (Figs. 1⇑ and 2⇑). The absence of IL-7 effects that we and others (21, 51) have observed in hybrid cultures is likely due to high IL-7 production by MS-5 and S17 stromal cell lines (>40-fold that of primary human or murine BM stroma; Fig. 2⇑) since human B cell production was reduced up to 17-fold (Fig. 2⇑A) by high levels of anti-mouse IL-7 neutralizing Abs. Thus, the human-only model revealed IL-7 effects on human B cell development that were not easily detectable in hybrid human-mouse cocultures. A critical role for IL-7 in adult B cell development has been demonstrated in vivo in the mouse model (11, 12, 13). IL-7 expression by primary murine BM stroma (Fig. 2⇑) and the level of IL-7 that elicits in vitro B cell precursor responses (1 ng/ml) in the mouse (59) are consistent with what we see during in vitro human B cell development (Figs. 1⇑ and 2⇑). The expression of IL-7Rα by B cell precursors (Fig. 7⇑) and of IL-7 by stromal cells (Fig. 5⇑) in primary human BM suggests that the IL-7 effects we observe in vitro are physiologically relevant for in vivo human B cell development. Indirect evidence for the in vivo role of IL-7 in human B cell development comes from patients with T cell lymphopenia in whom endogenous IL-7 is up-regulated and expansion of the immature B cell pool correlates with increased serum levels of IL-7 (60, 61). Data obtained using our human-only culture model provide the first evidence that human B cell production from HSCs in adult BM is dependent on IL-7. Robust IL-7-independent B cell production has been reported in human fetal BM (62). In the absence of IL-7, we observed that HSCs in CB, but not in BM, consistently give rise to a small population of CD19LO B lineage cells (Fig. 3⇑) that express EBF and PAX-5 at 3 wk and differentiate to generate very small numbers of IgM+ B cells at 5 wk (Fig. 1⇑). When switched to IL-7 at 3 wk, CD19LO cells generated in the absence of IL-7 respond by up-regulating CD19 and exhibiting increased cell size that is characteristic of cycling cells (Fig. 4⇑, B–D). Studies of B cell development in the mouse model suggest that IL-7-independent expression of EBF allows early B lineage differentiation (but not expansion unless IL-7 is present) during the fetal and neonatal period. This results in what has been described as a developmental switch in stem cells with IL-7-independent B cell production occurring through the first 2 wk of neonatal life, but not in the adult (9). Our data showing that human B cell development from HSCs in adult BM is IL-7-dependent, coupled with our characterization of B lineage cells generated from CB in the absence of IL-7, provide the first evidence that that such a developmental switch may also occur in human B lymphopoiesis. We found that adult BM, as compared with CB, shows a reduction of in vitro generative capacity that is progressively more profound in developmentally sequential populations (Figs. 3⇑ and 8⇑). The ability of adult BM to generate HSCs, IL-7R+ progenitors, and pro-B cells after 3 wk in human-only cultures with IL-7 was reduced by half, 10-, and 50-fold, respectively, of that observed for CB (Fig. 8⇑D). Indeed, the CD19+ generative capacity of BM HSCs in the presence of IL-7 was similar to that of CB HSCs in the absence of IL-7 activity (Fig. 3⇑). The B lymphoid-specific decrease in generative capacity that we observed for human HSCs in adult BM, as compared with CB, is consistent with a selective loss of B lymphoid generative capacity observed in xenograft transplant models and in the clinical transplant setting (63, 64). The decline in IL-7-dependent B lymphoid generative capacity that we have observed in adult vs fetal B cell development suggests that a mechanism other than the developmental switch observed in the mouse model may contribute to the decline in IL-7-independent B cell production that occurs during the progression to adulthood. It is possible that IL-7-induced expansion of the pro-B compartment (absent in the IL-7-indepdent B cell production observed by Kikuchi et al. in Ref. 9) is essential for B lymphopoiesis from adult HSCs because of their reduced generative capacity. Further studies will be needed to determine the extent to which the decline in B cell generative capacity contributes to the loss of IL-7-independent B lymphopoiesis in adult humans and mice and whether B cells arising from IL-7-dependent and IL-7-independent pathways in humans are functionally distinct. In summary, data obtained using our human-only culture model provide the first evidence that B cell development from HSCs in adult BM is dependent on IL-7 and characterize the progressive decline in developmentally sequential populations of B cell precursors that correlates with B cell production that is dependent on IL-7. These studies have implications for immune reconstitution following stem cell transplant with CB vs BM in the clinical setting. We thank Labor and Delivery at Kaiser Permanente-Sunset (Los Angeles, CA) for CB collection. We are grateful for FACS sorting services provided by the FACS core of the Division of Research Immunology and BM Transplantation, Childrens Hospital Los Angeles, and by Barbara N. Walter and the Genomics Core Flow Cytometry Facility of the University of California, Riverside Institute for Integrative Genome Biology. ↵1 This work was supported by the National Institutes of Health Grants K22 CA 111392 (to S.D.) and 5K01 DK066163 (to K.J.P. ), a Research Career Development Award from the Saban Research Institute at Childrens Hospital Los Angeles (to K.J.P. ), and the Center for Health Disparities and Molecular Medicine and the Department of Pathology and Human Anatomy, Loma Linda University (to K.J.P.). ↵3 Abbreviations used in this paper: BM, bone marrow; EBF, early B cell factor; CB, umbilical cord blood; cμ, cytoplasmic μ; FSC, forward scatter; HSC, hematopoietic stem cell; Lin−, lineage marker negative; ND50, 50% neutralizing dose; TSLP, thymic stromal-derived lymphopoietin. Medina, K. L., H. Singh. 2005. Genetic networks that regulate B lymphopoiesis. Curr. Opin. Hematol. 12: 203-209. Singh, H., J. M. Pongubala, K. L. Medina. 2007. Gene regulatory networks that orchestrate the development of B lymphocyte precursors. Adv. Exp. Med. Biol. 596: 57-62. Sitnicka, E., C. Brakebusch, I. L. Martensson, M. Svensson, W. W. Agace, M. Sigvardsson, N. Buza-Vidas, D. Bryder, C. M. Cilio, H. Ahlenius, et al 2003. Complementary signaling through flt3 and interleukin-7 receptor α is indispensable for fetal and adult B cell genesis. J. Exp. Med. 198: 1495-1506. Vosshenrich, C. A., A. Cumano, W. Muller, J. P. Di Santo, P. Vieira. 2003. Thymic stromal-derived lymphopoietin distinguishes fetal from adult B cell development. Nat. Immunol. 4: 773-779. Borge, O. J., J. Adolfsson, A. M. Jacobsen. 1999. Lymphoid-restricted development from multipotent candidate murine stem cells: distinct and complimentary functions of the c-kit and flt3-ligands. Blood 94: 3781-3790. Dias, S., H. Silva, Jr, A. Cumano, P. Vieira. 2005. Interleukin-7 is necessary to maintain the B cell potential in common lymphoid progenitors. J. Exp. Med. 201: 971-979. Kikuchi, K., A. Y. Lai, C. L. Hsu, M. Kondo. 2005. IL-7 receptor signaling is necessary for stage transition in adult B cell development through up-regulation of EBF. J. Exp. Med. 201: 1197-1203. Kikuchi, K., H. Kasai, A. Watanabe, A. Y. Lai, M. Kondo. 2008. IL-7 specifies B cell fate at the common lymphoid progenitor to pre-proB transition stage by maintaining early B cell factor expression. J. Immunol. 181: 383-392. Kikuchi, K., M. Kondo. 2006. Developmental switch of mouse hematopoietic stem cells from fetal to adult type occurs in bone marrow after birth. Proc. Natl. Acad. Sci. USA 103: 17852-17857. Lee, G., A. E. Namen, S. Gillis, L. R. Ellingsworth, P. W. Kincade. 1989. Normal B cell precursors responsive to recombinant murine IL-7 and inhibition of IL-7 activity by transforming growth factor-beta. J. Immunol. 142: 3875-3883. DiSanto, J. P., W. Muller, D. Guy-Grand, A. Fischer, K. Rajewsky. 1995. Lymphoid development in mice with a targeted deletion of the interleukin 2 receptor gamma chain. Proc. Natl. Acad. Sci. USA 92: 377-381. Saeland, S., V. Duvert, D. Pandrau, C. Caux, I. Durand, N. Wrighton, J. Wideman, F. Lee, J. Banchereau. 1991. Interleukin-7 induces the proliferation of normal human B-cell precursors. Blood 78: 2229-2238. Wolf, M. L., J. A. Buckley, A. Goldfarb, C. L. Law, T. W. LeBien. 1991. Development of a bone marrow culture for maintenance and growth of normal human B cell precursors. J. Immunol. 147: 3324-3330. Moreau, I., V. Duvert, J. Banchereau, S. Saeland. 1993. Culture of human fetal B-cell precursors on bone marrow stroma maintains highly proliferative CD20dim cells. Blood 81: 1170-1178. Moreau, I., V. Duvert, C. Caux, M. C. Galmiche, P. Charbord, J. Banchereau, S. Saeland. 1993. Myofibroblastic stromal cells isolated from human bone marrow induce the proliferation of both early myeloid and B-lymphoid cells. Blood 82: 2396-2405. Dittel, B. N., T. W. LeBien. 1995. The growth response to IL-7 during normal human B cell ontogeny is restricted to B-lineage cells expressing CD34. J. Immunol. 154: 58-67. Namikawa, R., M. O. Muench, J. E. de Vries, M. G. Roncarolo. 1996. The FLK2/FLT3 ligand synergizes with interleukin-7 in promoting stromal-cell-independent expansion and differentiation of human fetal pro-B cells in vitro. Blood 87: 1881-1890. Kurosaka, D., T. W. LeBien, J. A. Pribyl. 1999. Comparative studies of different stromal cell microenvironments in support of human B-cell development. Exp. Hematol. 27: 1271-1281. Rawlings, D. J., S. G. Quan, R. M. Kato, O. N. Witte. 1995. Long-term culture system for selective growth of human B-cell progenitors. Proc. Natl. Acad. Sci. USA 92: 1570-1574. Taguchi, T., H. Takenouchi, Y. Shiozawa, J. Matsui, N. Kitamura, Y. Miyagawa, Y. U. Katagiri, T. Takahashi, H. Okita, J. Fujimoto, N. Kiyokawa. 2007. Interleukin-7 contributes to human pro-B-cell development in a mouse stromal cell-dependent culture system. Exp. Hematol. 35: 1398-1407. Noguchi, M., H. Yi, H. M. Rosenblatt, A. H. Filipovich, S. Adelstein, W. S. Modi, O. W. McBride, W. J. Leonard. 1993. Interleukin-2 receptor gamma chain mutation results in X-linked severe combined immunodeficiency in humans. Cell 73: 147-157. Macchi, P., A. Villa, S. Giliani, M. G. Sacco, A. Frattini, F. Porta, A. G. Ugazio, J. A. Johnston, F. Candotti, J. J. O'Shea, et al 1995. Mutations of Jak-3 gene in patients with autosomal severe combined immune deficiency (SCID). Nature 377: 65-68. Puel, A., S. F. Ziegler, R. H. Buckley, W. J. Leonard. 1998. Defective IL7R expression in T−B+NK+ severe combined immunodeficiency. Nat. Genet. 20: 394-397. LeBien, T. W.. 2000. Fates of human B-cell precursors. Blood 96: 9-23. Bertrand, F. E., C. E. Eckfeldt, J. R. Fink, A. S. Lysholm, J. A. Pribyl, N. Shah, T. W. LeBien. 2000. Microenvironmental influences on human B-cell development. Immunol. Rev. 175: 175-186. Roifman, C. M., J. Zhang, D. Chitayat, N. Sharfe. 2000. A partial deficiency of interleukin-7Rα is sufficient to abrogate T-cell development and cause severe combined immunodeficiency. Blood 96: 2803-2807. Espeli, M., B. Rossi, S. J. Mancini, P. Roche, L. Gauthier, C. Schiff. 2006. Initiation of pre-B cell receptor signaling: common and distinctive features in human and mouse. Semin. Immunol. 18: 56-66. Carvalho, T. L., T. Mota-Santos, A. Cumano, J. Demengeot, P. Vieira. 2001. Arrested B lymphopoiesis and persistence of activated B cells in adult interleukin 7−/− mice. J. Exp. Med. 194: 1141-1150. Saeland, S., V. Duvert, I. Moreau, J. Banchereau. 1993. Human B cell precursors proliferate and express CD23 after CD40 ligation. J. Exp. Med. 178: 113-120. Pribyl, J. R., B. N. Dittel, T. W. LeBien. 1995. In vitro studies of human B lymphopoiesis. Ann. NY Acad. Sci. 764: 9-18. Lin, J. X., T. S. Migone, M. Tsang, M. Friedmann, J. A. Weatherbee, L. Zhou, A. Yamauchi, E. T. Bloom, J. Mietz, S. John, et al 1995. The role of shared receptor motifs and common Stat proteins in the generation of cytokine pleiotropy and redundancy by IL-2, IL-4, IL-7, IL-13, and IL-15. Immunity 2: 331-339. Dai, X., Y. Chen, L. Di, A. Podd, G. Li, K. D. Bunting, L. Hennighausen, R. Wen, D. Wang. 2007. Stat5 is essential for early B cell development but not for B cell maturation and function. J. Immunol. 179: 1068-1079. Yao, Z., Y. Cui, W. T. Watford, J. H. Bream, K. Yamaoka, B. D. Hissong, D. Li, S. K. Durum, Q. Jiang, A. Bhandoola, et al 2006. Stat5a/b are essential for normal lymphoid development and differentiation. Proc. Natl. Acad. Sci. USA 103: 1000-1005. Barata, J. T., A. Silva, M. Abecasis, N. Carlesso, A. Cumano, A. A. Cardoso. 2006. Molecular and functional evidence for activity of murine IL-7 on human lymphocytes. Exp. Hematol. 34: 1133-1142. Payne, K. J., G. Huang, E. Sahakian, J. Y. Zhu, N. S. Barteneva, L. W. Barsky, M. A. Payne, G. M. Crooks. 2003. Ikaros isoform x is selectively expressed in myeloid differentiation. J. Immunol. 170: 3091-3098. Nolta, J. A., F. T. Thiemann, J. Arakawa-Hoyt, M. A. Dao, L. W. Barsky, K. A. Moore, I. R. Lemischka, G. M. Crooks. 2002. The AFT024 stromal cell line supports long-term ex vivo maintenance of engrafting multipotent human hematopoietic progenitors. Leukemia 16: 352-361. Collins, L. S., K. Dorshkind. 1987. A stromal cell line from myeloid long-term bone marrow cultures can support myelopoiesis and B lymphopoiesis. J. Immunol. 138: 1082-1087. Ohkawara, J. I., K. Ikebuchi, M. Fujihara, N. Sato, F. Hirayama, M. Yamaguchi, K. J. Mori, S. Sekiguchi. 1998. Culture system for extensive production of CD19+IgM+ cells by human cord blood CD34+ progenitors. Leukemia 12: 764-771. Shah, A. J., E. M. Smogorzewska, C. Hannum, G. M. Crooks. 1996. Flt3 ligand induces proliferation of quiescent human bone marrow CD34+CD38− cells and maintains progenitor cells in vitro. Blood 87: 3563-3570. Miller, J. S., V. McCullar, M. Punzel, I. R. Lemischka, K. A. Moore. 1999. Single adult human CD34+/Lin−/CD38− progenitors give rise to natural killer cells, B-lineage cells, dendritic cells, and myeloid cells. Blood 93: 96-106. Crooks, G. M., Q. L. Hao, D. Petersen, L. W. Barsky, D. Bockstoce. 2000. IL-3 increases production of B lymphoid progenitors from human CD34+CD38− cells. J. Immunol. 165: 2382-2389. Zhang, Y., K. J. Payne, Y. Zhu, M. A. Price, Y. K. Parrish, E. Zielinska, L. W. Barsky, G. M. Crooks. 2005. SCL expression at critical points in human hematopoietic lineage commitment. Stem Cells 23: 852-860. Rawlings, D. J., S. Quan, Q. L. Hao, F. T. Thiemann, M. Smogorzewska, O. N. Witte, G. M. Crooks. 1997. Differentiation of human CD34+CD38− cord blood stem cells into B cell progenitors in vitro. Exp. Hematol. 25: 66-72. Fluckiger, A. C., E. Sanz, M. Garcia-Lloret, T. Su, Q. L. Hao, R. Kato, S. Quan, A. de la Hera, G. M. Crooks, O. N. Witte, D. J. Rawlings. 1998. In vitro reconstitution of human B-cell ontogeny: from CD34+ multipotent progenitors to Ig-secreting cells. Blood 92: 4509-4520. Hao, Q. L., E. M. Smogorzewska, L. W. Barsky, G. M. Crooks. 1998. In vitro identification of single CD34+CD38− cells with both lymphoid and myeloid potential. Blood 91: 4145-4151. Berardi, A. C., E. Meffre, F. Pflumio, A. Katz, W. Vainchenker, C. Schiff, L. Coulombel. 1997. Individual CD34+CD38lowCD19−CD10− progenitor cells from human cord blood generate B lymphocytes and granulocytes. Blood 89: 3554-3564. Nishihara, M., Y. Wada, K. Ogami, Y. Ebihara, T. Ishii, K. Tsuji, H. Ueno, S. Asano, T. Nakahata, T. Maekawa. 1998. A combination of stem cell factor and granulocyte colony-stimulating factor enhances the growth of human progenitor B cells supported by murine stromal cell line MS-5. Eur. J. Immunol. 28: 855-864. Kroemer, R. T., R. Kroncke, J. Gerdes, W. G. Richards. 1998. Comparison of the 3D models of four different human IL-7 isoforms with human and murine IL-7. Protein Eng. 11: 31-40. Goodwin, R. G., S. Lupton, A. Schmierer, K. J. Hjerrild, R. Jerzy, W. Clevenger, S. Gillis, D. Cosman, A. E. Namen. 1989. Human interleukin 7: molecular cloning and growth factor activity on human and murine B-lineage cells. Proc. Natl. Acad. Sci. USA 86: 302-306. Jensen, C. T., S. Kharazi, C. Boiers, M. Cheng, A. Lubking, E. Sitnicka, S. E. Jacobsen. 2008. FLT3 ligand and not TSLP is the key regulator of IL-7-independent B-1 and B-2 B lymphopoiesis. Blood 112: 2297-2304. Wolf, M. L., W. K. Weng, K. T. Stieglbauer, N. Shah, T. W. LeBien. 1993. 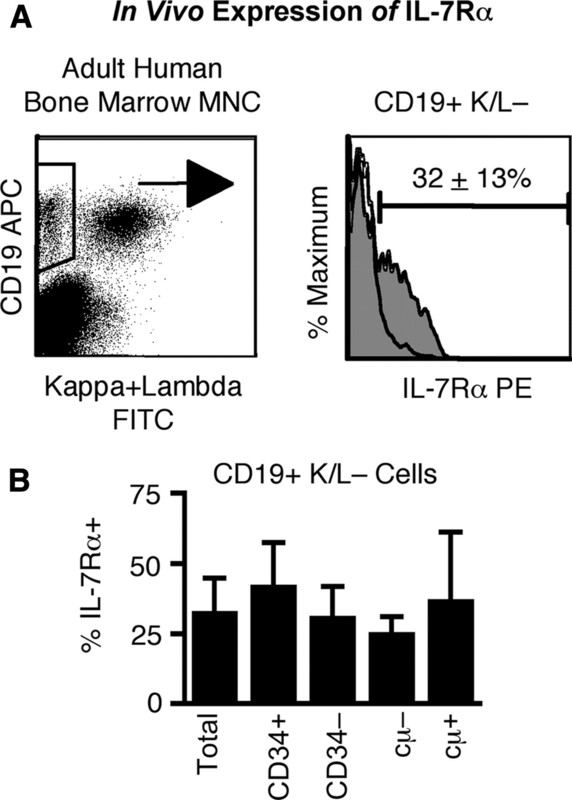 Functional effect of IL-7-enhanced CD19 expression on human B cell precursors. J. Immunol. 151: 138-148. O'Riordan, M., R. Grosschedl. 1999. Coordinate regulation of B cell differentiation by the transcription factors EBF and E2A. Immunity 11: 21-31. Hao, Q. L., J. Zhu, M. A. Price, K. J. Payne, L. W. Barsky, G. M. Crooks. 2001. Identification of a novel, human multilymphoid progenitor in cord blood. Blood 97: 3683-3690. Ryan, D. H., B. L. Nuccie, I. Ritterman, J. L. Liesveld, C. N. Abboud, R. A. Insel. 1997. Expression of interleukin-7 receptor by lineage-negative human bone marrow progenitors with enhanced lymphoid proliferative potential and B-lineage differentiation capacity. Blood 89: 929-940. Medina, K. L., P. W. Kincade. 1994. Pregnancy-related steroids are potential negative regulators of B lymphopoiesis. Proc. Natl. Acad. Sci. USA 91: 5382-5386. Malaspina, A., S. Moir, J. Ho, W. Wang, M. L. Howell, M. A. O'Shea, G. A. Roby, C. A. Rehm, J. M. Mican, T. W. Chun, A. S. Fauci. 2006. Appearance of immature/transitional B cells in HIV-infected individuals with advanced disease: correlation with increased IL-7. Proc. Natl. Acad. Sci. USA 103: 2262-2267. Malaspina, A., S. Moir, D. G. Chaitt, C. A. Rehm, S. Kottilil, J. Falloon, A. S. Fauci. 2006. Idiopathic CD4+ T lymphocytopenia is associated with increases in immature/transitional B cells and serum levels of IL-7. Blood 109: 2086-2088. Pribyl, J. A., T. W. LeBien. 1996. Interleukin 7 independent development of human B cells. Proc. Natl. Acad. Sci. USA 93: 10348-10353. Arakawa-Hoyt, J., M. A. Dao, F. Thiemann, Q. L. Hao, D. C. Ertl, K. I. Weinberg, G. M. Crooks, J. A. Nolta. 1999. The number and generative capacity of human B lymphocyte progenitors, measured in vitro and in vivo, is higher in umbilical cord blood than in adult or pediatric bone marrow. Bone Marrow Transplant. 24: 1167-1176. Inoue, H., Y. Yasuda, K. Hattori, T. Shimizu, M. Matsumoto, M. Yabe, H. Yabe, F. Tsuchida, Y. Tanaka, G. Hosoi, et al 2003. The kinetics of immune reconstitution after cord blood transplantation and selected CD34+ stem cell transplantation in children: comparison with bone marrow transplantation. Int. J. Hematol. 77: 399-407.